Ling Ling, a 29-year-old living in Shanghai, has gone to great lengths to curate a picture-perfect life on social media. Her photos on micro-blogging site Weibo show her glamorous and leisurely life. Dressed in fashionable clothing and with immaculate make-up, Ling Ling is seen dining at fancy cafes and restaurants; attending parties and social events with her girlfriends; travelling to places like Boracay, Tokyo and Dubai. But she does not cultivate her online image just to make herself feel good or her friends jealous. She is one of the new internet celebrities, known as Wang Hong. It's a lucrative business, with Zhang Dayi, one of China's best known Wang Hong, reportedly earning 300m yuan (£35m; $46m). This compares favourably to top Chinese actress Fan Bingbing, who according to Forbes, made about $21m last year. Media captionHow do you create an online celebrity? There are two types of internet celebrities in China - those who create original content like Papi Jiang, who was once censured by Chinese authorities for excessive use of foul language in her videos, and the "fashionistas". 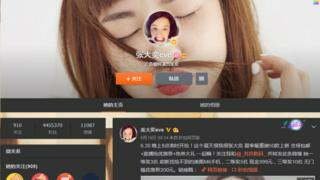 Ling Ling and Zhang Dayi fall into the second category, selling clothes and cosmetics on Taobao, China's leading online shopping site. They work as their own shops' models by posting pictures of themselves wearing the clothes they sell, and some of their followers become their most loyal customers. Ling Ling, who has been active online for 10 years and has more than 330,000 followers on Weibo, says she didn't plan on becoming an internet celebrity. "In the beginning, there were only online forums. I posted pictures and wrote online every day and a lot of people started paying attention to me." When she was 18, Ling Ling started a bricks-and-mortar clothing shop in Shanghai, but she soon realised that her online fame would bring more business. "You will be able to reach to customers across the nation with an online store. I've got quite a lot of customers in Beijing and Guangzhou," she says. 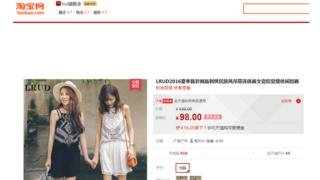 Her Taobao shop generates around 300,000 yuan in sales every month and that figure can double during festivals. But these numbers did not satiate her ambition, so she signed a contract with Tophot, an incubator aimed at nurturing top internet celebrities. According to CBNData, a commercial data company affiliated with Alibaba, the "internet celebrity economy" is set to be worth 58bn yuan in 2016, more than China's box office in 2015. The enormous earning potential has led to the rise of internet celebrity incubators in China, which race to discover and nurture the next Zhang Dayi. Incubators like Tophot provide training for budding internet celebrities, with skills in photography, make-up and performance. They also represent internet celebrities and help them find jobs like product endorsements. In return, they take a cut from their earnings. Janet Chen, founder of Tophot, said internet celebrities had already "outperformed" showbiz A-listers and she attributes this to the fact that they are more down-to-earth and approachable. "Zhang Dayi is not an exceptional beauty, but she looks like someone you can be friends with. 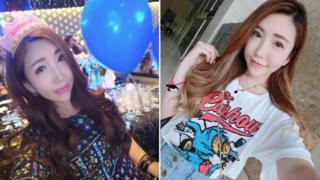 People think they can look like her if they put on some make-up," Ms Chen says. She says Tophot has signed cooperation agreements with 30,000 emerging internet celebrities. Although obviously not all are set for stardom. And internet celebrity incubators are becoming increasingly popular with investors, says Zhang Yi, founder of iiMedia Research, a Guangzhou-based media consultancy firm. He says there are already about 50 internet celebrity incubators in China. But, he points out, some investors worry about the long-term prospects of the industry. "A lot of factors behind [the popularity of] internet celebrities cannot be duplicated," Mr Zhang says. "The failure rate [of investment of internet celebrity incubators] is 95% or above." Others in China worry about the standards of beauty online celebrities are creating for Chinese women. An attractive appearance seems to have become an indispensable quality for internet celebrities, and "internet celebrity face", which refers to the combination of doe eyes, a pointy chin, a high nose and fair skin, is a commonly used shorthand in China. According to CBNData, about 90% of customers of the online shops run by internet celebrities are females. In the report published by iiMedia Research, about 10% of internet celebrities admitted that they had undergone plastic surgery. "Internet celebrities create standard, rigid aesthetics and body images for women," says Li Sipan, founder of Women Awakening Network, a feminist group based in Guangzhou. 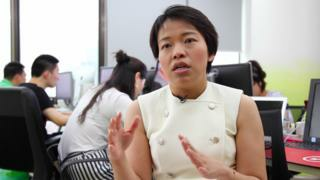 Ms Li also says that many young women would believe that being an internet celebrity was a fast-track to success, and imitate their behaviour. But the fans are devoted and unlike with movie stars and top musicians, they get a lot of access to their favourite internet celebrity. Ling Ling employees six assistants, but she says she is the one who interacts with her fans online. Apart from Weibo and WeChat, Ling Ling also conducts live-streaming sessions at times. "Fans are most important," Ling Ling says. "I have been working in the business for 10 years and I am thankful for the support of my fans." "Ling Ling is very friendly [to fans]. There are always chances for us to meet her," says Hu Xiaofei, a long-time fan who spends about 1,000 yuan on Ling Ling's shop every season. "She is like an idol [to me]. I will learn how to mix and match and put on make-up from her posts." Janet Chen firmly believes that the digital native generation - those born in and after the 90s like Hu Xiaofei - will continue to fuel the popularity of internet celebrities in the long run. "When these generations become the mainstream group, their [digital] habits will dominate society's consumption pattern," she adds. However, Ling Ling admits that she sometimes feels insecure. "There are so many [social media] platforms and new internet celebrities. There are more and more pretty girls… Even for top internet celebrities, if they do not work hard, people may not know them at all in a few years."